Six generations of the Fay family have served the Worcester area since 1870. Today the firm is operated by William J. Fay, and his son William J. Fay II. The Fay family strives to provide the highest level of ethical professional and personal service to the families we serve. In 1992 the Fay family opened a second funeral home, located in the center of West Boylston. Since that time, the West Boylston facility has been completely renovated and is continuously being improved. In 2003 the Fay family merged with longtime friends the Lundins. Walter and Robert Lundin have owned and operated the Lindquist Lundin Funeral Home for more than 30 years and the home has served the Worcester area since 1899. We continue to maintain the same professional service, that they have provided for many years. In February 2005, we were excited to announce a merger with Philip W. Callahan and the Callahan Brothers Funeral Home. As part of the merger plan, Fay Brothers closed its current operation at 9 Hammond Street and consolidated its services at 61 Myrtle Street in Worcester, the present-day site of Callahan Brothers. 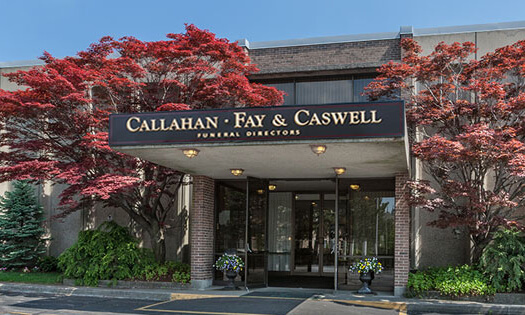 In May of 2014, The Caswell King Funeral Home located at 474 Grove Street in Worcester joined with the Fay Family and relocated their business to our Main Worcester Office. The Funeral Home was renamed Callahan, Fay & Caswell Funeral Home, 61 Myrtle Street Worcester. The Fay Funeral Homes are constantly seeking improvements that will provide families with funerals that are as comforting and memorable as possible. We are committed to providing compassionate, personal service and are sensitive to the diverse needs of individuals. We provide many different funeral options, allowing each family to create a meaningful way to remember their loved one. Throughout the years, we have developed a high level of sensitivity to the religious, ethnic and economic circumstances of all the families we serve. Thank you again for visiting our site! Please feel free to contact us with any questions you may have regarding our funeral services.